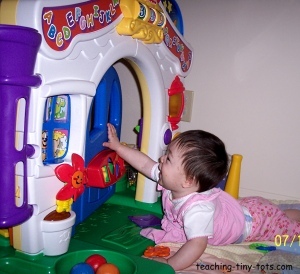 Toddler Toys: The Laugh and Learn Learning Home by Fisher Price has been one of the best investments that we have made in toys. 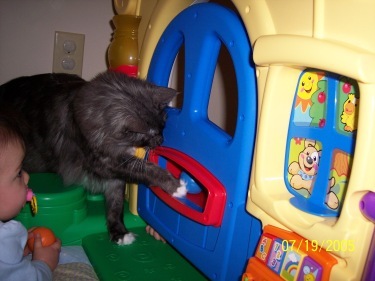 A great interactive toy great for a variety of ages. With the millions of toddler toys on the market, The Laugh and Learn Home is definitely one worth investing in. It is age appropriate for 6 months - 36 months and I would say it is the one of the few toys that has entertained them for that length of time. It's interactive on both sides and starting from "tummy time" days they can start to explore the roller, and radio. As they sit crawl they will start to go through the door and entertain themselves with the balls, shapes and the mailbox. When they start to stand they will explore the numbers the top and the clock. When they were 2 and 3 they would pretend it was their home or their stuffed animal's home. Learn the alphabet with the sing-along radio and other activities. Spin house numbers and move dials on clock. Lots of opposites to learn like up and down, on and off, open and close, day and night. Sort shapes and learn colors. The balls and the "mail" are large enough not to be a choking hazard. Just out of extra precaution I did not let them use the mail without monitoring until they were older. After 3 years we did not have any pieces broken off, however if you are purchasing one previously loved...check all parts especially the flower which I know the girls bent forward frequently. We did watch at first to make sure they didn't bang the door too hard on eachother. I think they learned pretty quickly how that worked and the holes helped them see the other. They did pull themselves up to a standing position by holding on to it and it has never tipped over although they never did try to purposely tip it over. Again as I will continue to caution, always check for recalls because they can come out even after a toy has been out on the market for a while. Place of manufacturing or material used may change so it's always a good idea to check the CPSC which I have a direct link to on the Toddler Toys page for your convenience. As you can see our "third twin" also enjoyed the Learning House and in fact was quite the teacher when it came to demonstrating how to push the door open and even how to press some of the buttons.